Had a little spare time and a few spare parts so I threw together a trailer for the up coming season. I tried to load the pics but I am having problems with the puter after a windows upgrade. hopefully this link will get you into some pics of the progress made on my new trailer . Just one question. Does it need a license plate and if so, where does it go? Here in MN you get a lifetime license in the form of a sitcker that goes on the tounge of the trailer. Wow! Nice job "throwing" that trailer together. I wish that I could throw half as well. Threw was a term used because all of the parts,from the 1x2 tube steel and plywood to axel and springs, came out of the back room in the shop. Looks nice! Any concerns with longevity from the wooden body? What's the weight of the rig? I am not overly concerned about the body holding up. It has 7 coats of enamel on the exterior and the underside recieved three coats of bedliner prior to being set on frame. It came in a bit overweight at 182# but tracks true and carries 12# of tounge weight empty. Would definately catch the eye while traveling. 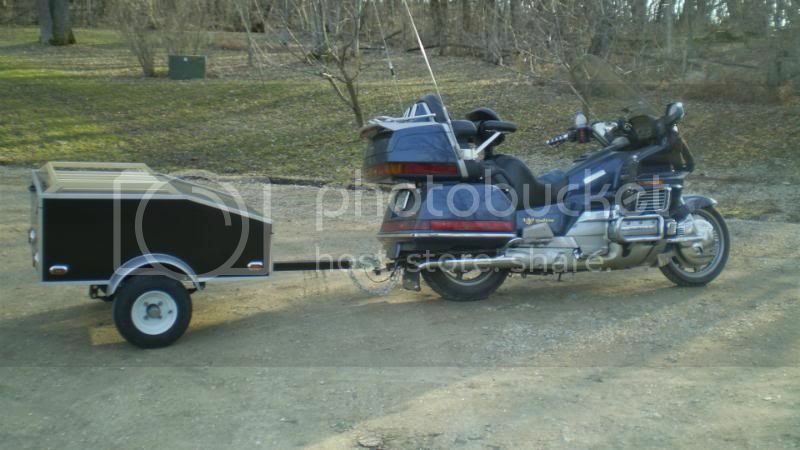 Nice toouch with the wood luggage rack.... the base trailer looks like my cut down boat trailer almost.. nice throw job.. I love it. Good job. I was thinking about making something like this. Good job. I'll have my welding students make me one. Way better then ours eh Vegas? ?